When you are helping clients to lose weight this will involve looking into their general eating patterns and helping them to make the necessary changes for a healthy lifestyle. People who snack often don't even realize how many calories they are taking in and this soon adds up to extra pounds in weight. Most of the time their snacking is mindless because it has been going on for so long that it has become an ingrained habit. 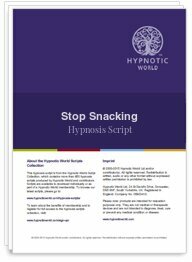 This Stop Snacking hypnosis script can help your client to gain control over their eating and as they take control, they find this spills over into other areas of life, such as increased confidence. This script is packed with positive suggestions, talking directly to the subconscious mind and helping to motivate your client to eat only at mealtimes which should result in a healthy weight loss. The script also uses future pacing and analogue marking.